The Disgruntled Chef at Ann Siang Road has changed its name to The Disgruntled Brasserie. In conjunction with that, it has revamped its menu and welcome Chef de Cuisine Desmond Goh to helm the kitchen. 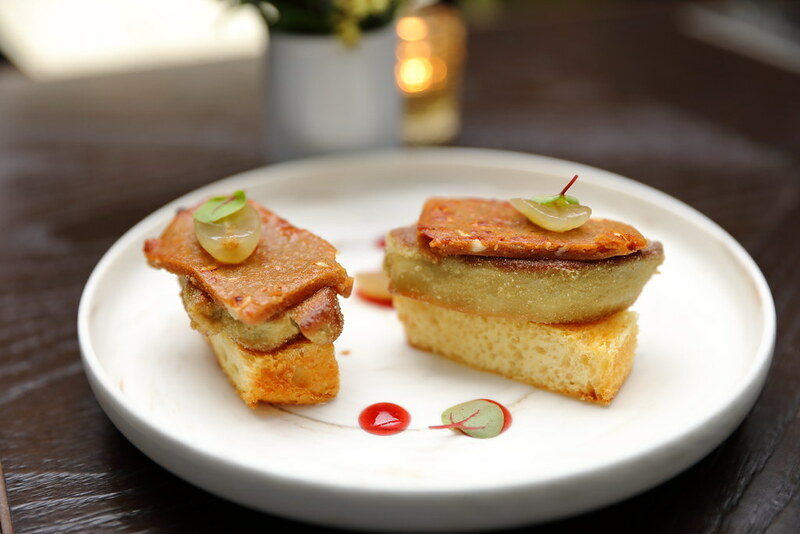 While the menu has been refreshed, it still kept to the concept of small and large plates. Dinner started with some small plates from the menu. 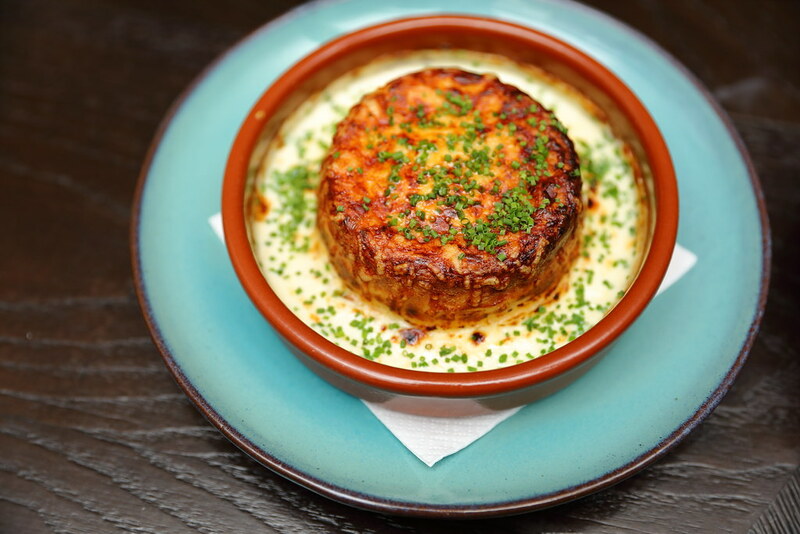 The Gruyere Cheese Soufflé ($16) was not only pretty in presentation it was also beautiful on the palate. The gruyere cheese and caramelised onions worked in harmony to develop a memorable experience complemented by the the Chardonnay fondue. 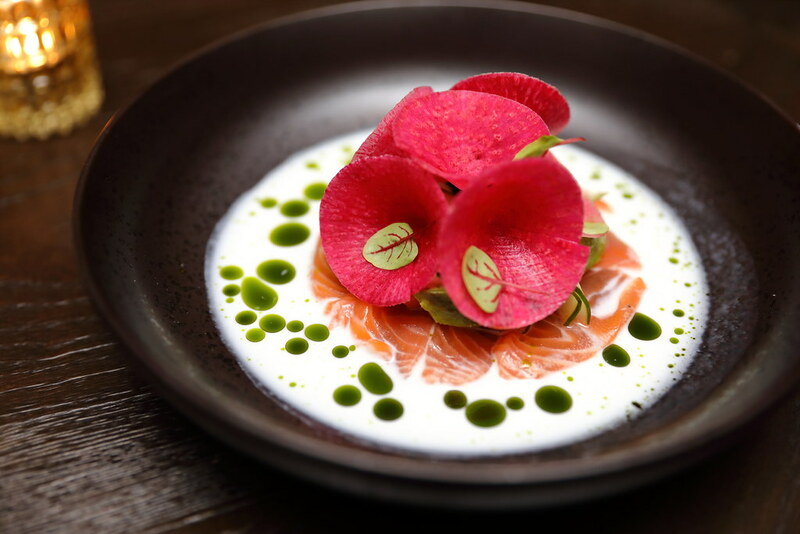 I have to admit I was admiring the beautiful shaped pickled cucumber that I did not notice the bed of Home Cured Salmon ($16) resting in the pool of horseradish buttermilk and comes with marinated acocadoes. Another dish that delight my palate and impressed me. It will be perfect if the pickled cucumber has more zest to it. While the first two dishes impressed, the Foie Gras & Peanut Butter Miso ($18) was a bit disappointing. 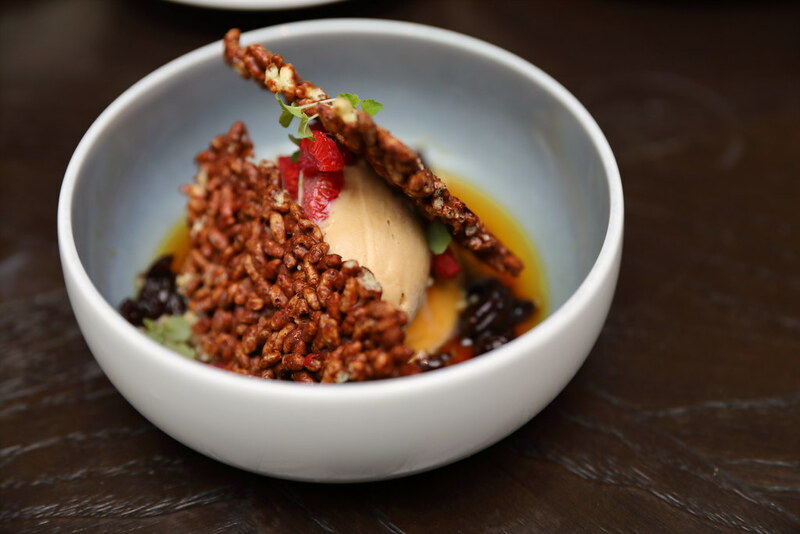 The richness of the peanut butter miso kind of masked the taste of the foie gras, losing the focus of the dish. Saying that the black current gel and poached grapes gave a refreshing touch to the dish. Moving to the big plates, we tried the Chilean White Cod ($38) which seemed to be the group's favourite. 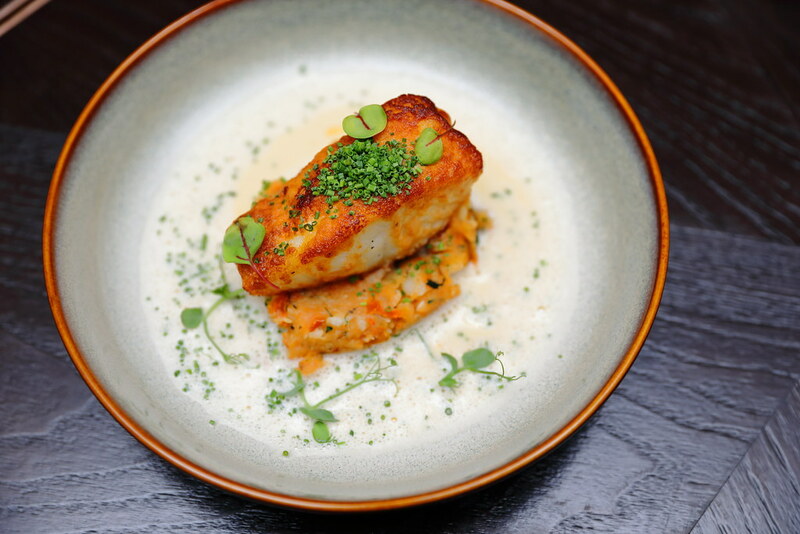 Resting on top of the salted cod brandade is the perfectly cooked Chilean white cod, moist and buttery. I also applauded the use of the normande sauce which complemented the fish excellently. 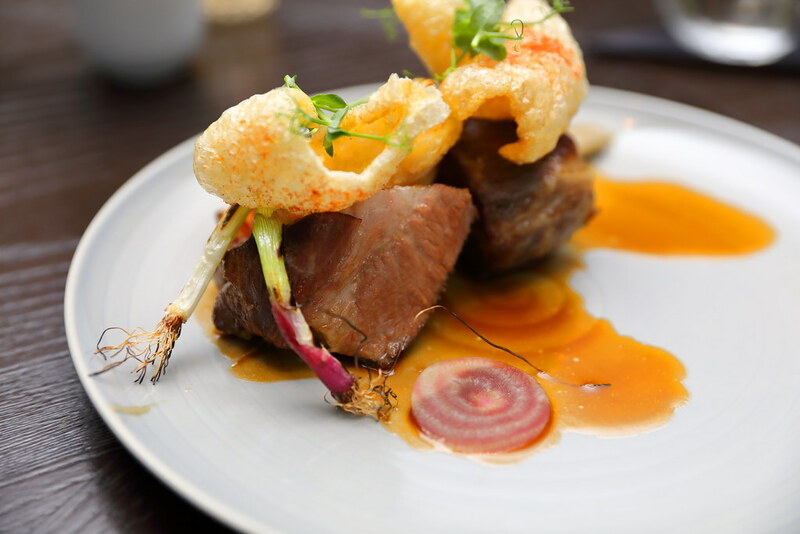 The Iberico Pork Collar ($32) comes with caraway milk poached caramelised cabbage, jerusalem artichoke puree, grilled scallions and dressed in star anise jus. The quality piece of meat was flavourosme on its own but it's supporting casts did not make the dish oscar worth. For something hearty and comforting, I would recommend the Seafood Boullabaise ($38). You can find seafood such as barramundi, clams, mussels, shrimps, squid swimming in the red sea. 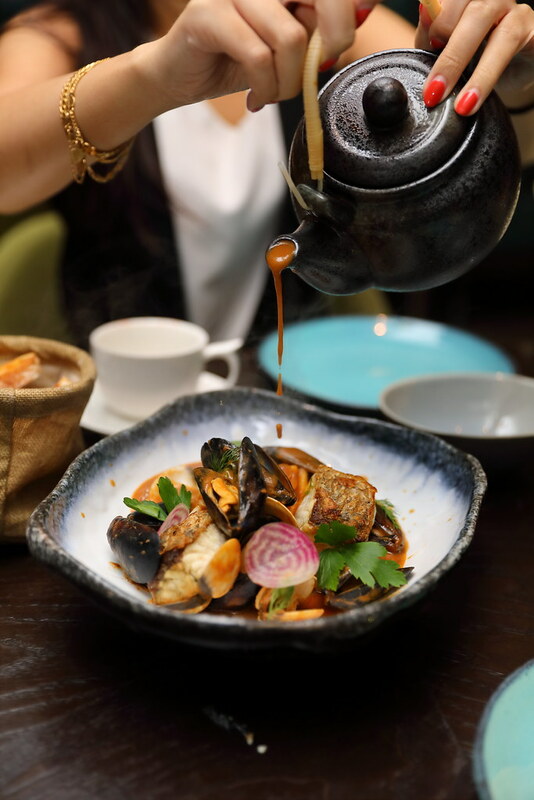 For a fuller enjoyment of the delectable broth, dunk the rouili toast into soup to soak up the goodness. 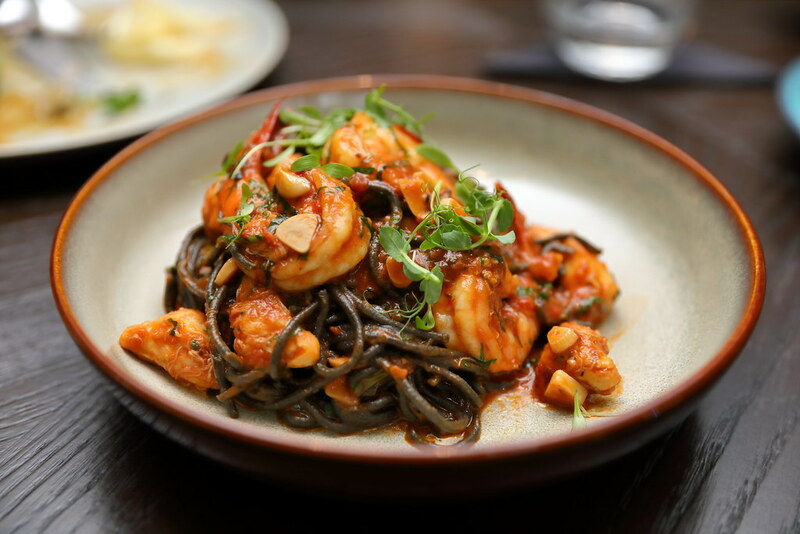 Our last main is a plat of freshly made Squid Ink Pasta ($28). The al dente pasta was coated in a mildly spiced chilli sauce that gave the dish an extra dimension. It also paired excellent with the shrimps and crabmeat. Moving to the dessert menu, the Bailey's Creme Caramel ($18) will delight those that enjoy's alocohol in the dessert. There are Remy Martin cherry compote, cocoa rice crisps and kahlua ice cream. 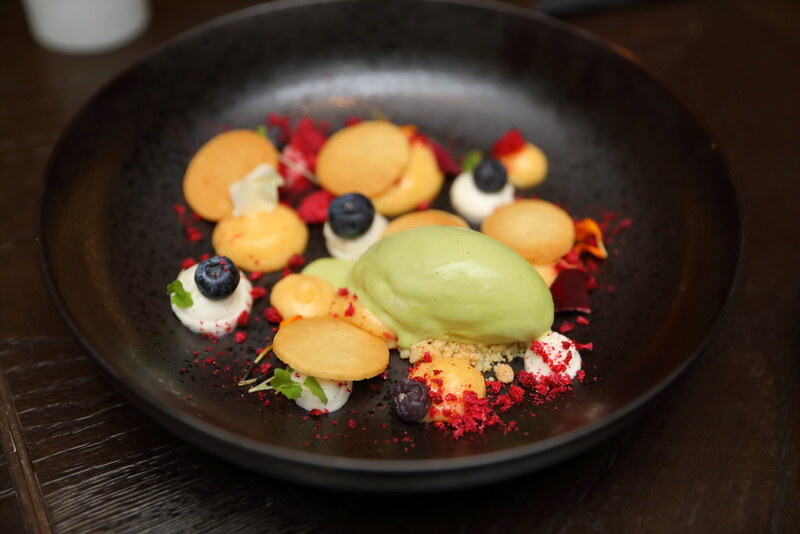 For those that like sour stuff, the Lemon Curd ($16) will be the ideal dessert which consists of biscuit, wildberries vanilla chantily cream and shiso leaf ice cream. The refreshing dessert is also a good choice after a heavy meal if you want something light to round off the dinner experience. Sometime old is gold. I like the Chocolate Fondant ($18) among the 4 desserts we tried. 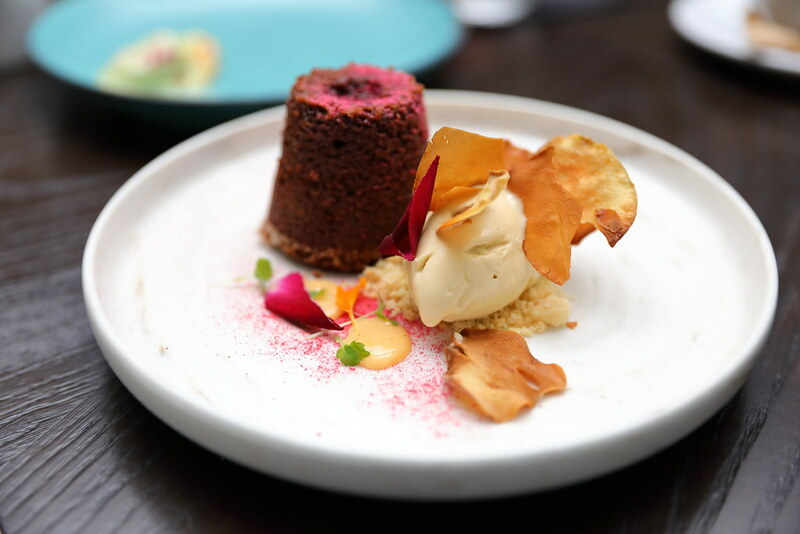 The chocolate fondant has a slightly crisp exterior, giving it a nice texture contrast. The bittersweet chocolate flavour is beautifully paired with creme anglaise and pistachio ice cream for a harmonize finish. 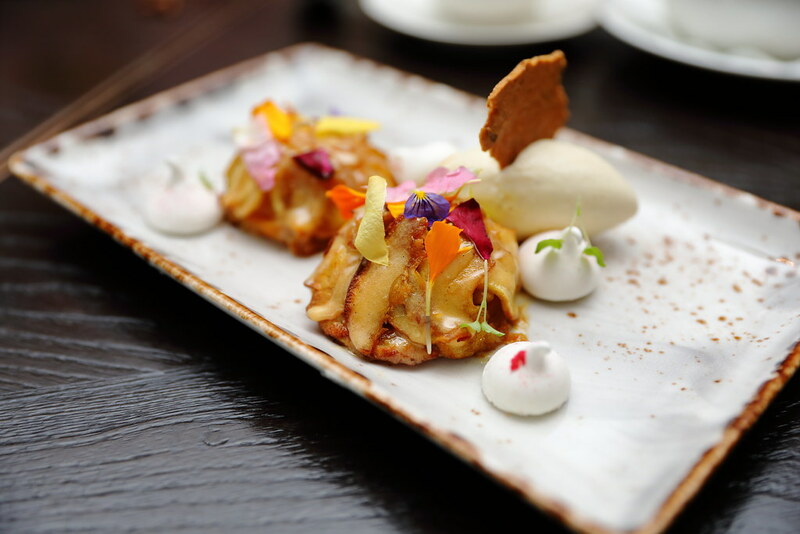 Warming our hearts is the Apple Tarte Tatin ($16) that is paired with almond cream and vanilla bean ice cream. The star has to be the apple that is not too sweet and has a good crunch to it. Overall I have enjoyed the revamped menu at The Disgruntled Brasserie. 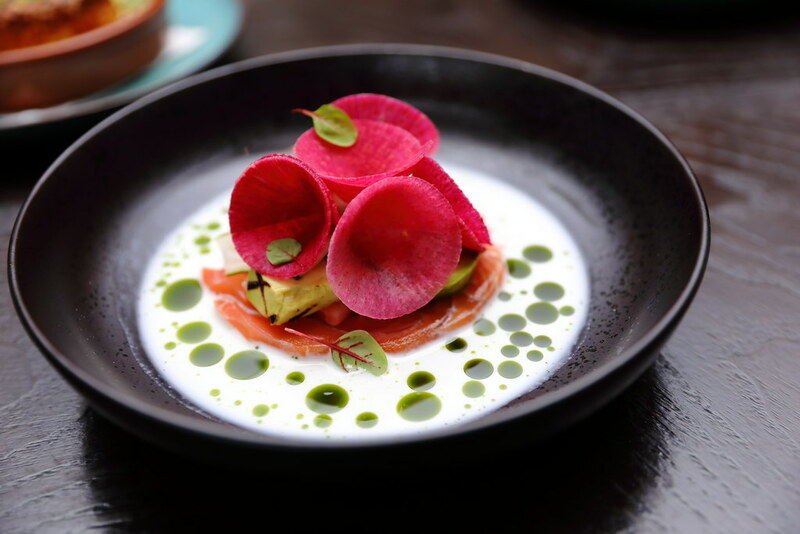 With the competitive F&B scene, restaurants need to be always coming out with new concepts or dishes. It is timely The Disgruntled Brasserie has refreshed their menu offering something new for diners.